The CR9000XC, a compact version of the CR9000X, holds up to five user-selectable I/O modules. It is a modular, multiprocessor system that provides precision measurement capabilities in a rugged, battery-operated package. It consists of an environmental enclosure, a base system, and a chassis containing slots for the I/O modules. The CR9000X series is our fastest data logger series, with a measurement rate of 100,000 Hz and a clock speed of 180 MHz, making it ideal for rapid sampling applications. For the entire list of available I/O modules for the CR9000XC and CR9000X, visit the Other Accessories section of the Ordering Info page for the CR9000XC and the CR9000X. Campbell Scientific also offers the CR9000X, a larger version, that accepts up to nine I/O modules. For more information, visit the CR9000X Product Info page. Up to five I/O modules can be used to configure a system for your specific application. Throughput of 100,000 measurements per second is ideal for high demand research, such as flux and complex structural monitoring. The CR9000XC's base system includes a CR9032 CPU module, CR9041 A/D module, CR9011 power supply module, and 128-Mbytes SDRAM memory for program and data storage. The CR9000XC's internal battery has a 7-Ahr capacity. I/O modules whose model numbers end in an E (e.g., CR9051E, CR9055E) and the CR9052DC include an easy connector module. Easy connector modules allow sensor wiring to remain connected while the input module’s measurement electronics and the rest of the data logger system are used elsewhere. The CR9000XC includes a non-corrosive, sealed, aluminum enclosure that provides protection from water, dust, and most environmental pollutants. In August 2004, the CR9000XC replaced the CR9000C. The CR9000C and CR9000XC dataloggers differ in their CPU Module; the CR9000C datalogger uses the CR9031 and the CR9000XC datalogger uses the CR9032. The CR9032 CPU module supports a measurement rate of up to 100,000 Hz, provides a 180 MHz clock speed, and adds a built-in RS-232 port, 10baseT/100baseT port, CS I/O port, and PC-card slot. The built-in ports enable communication without using the special interfaces (e.g., PLA100, TL925, NL105) that were required for the retired CR9000C datalogger. The PC-card slot allows the CR9000XC to store data on a Type I, Type II, or Type III PCMCIA card, or on a CompactFlash® card if an adapter is used. An existing CR9000C datalogger may be upgraded to a CR9000XC by replacing the CR9031 CPU module with the CR9032 CPU module. For the CR9000XC, the current drain, weights, and specific number of input/output channels depend on the I/O modules chosen. Customers can add CR9000XC dataloggers to networks containing the older CR9000 or CR9000C dataloggers. I/O modules other than the CR9080 can be used with either the CR9000 series or CR9000X series. CR9000 series communication interfaces (i.e., NL105, BLC100, TL925, PLA100) are not compatible with the CR9000XC, and therefore have been retired. RTDAQ software is not compatible with the older CR9000(C). Customers can upgrade a CR9000C datalogger to a CR9000XC datalogger by replacing the CR9000C's CR9031 CPU module with the contemporary CR9032C CPU module. With several channel types, the CR9000XC is compatible with many sensors, including thermocouples and 4 to 20 mA sensors. Measurement and control peripherals typically used with the CR9000XC are our AM25T 25-Channel Solid State Multiplexer, SDM-CAN Interface, SDM-INT8 Eight Channel Interval Timer, and SDM-SIO4 Serial Input/Output Module. Other measurement and control peripherals are compatible but they do not support the CR9000XC datalogger's maximum measurement rate and are therefore impractical for most CR9000XC applications. The CR9000XC typically communicates with a PC via direct connect or Ethernet. Because the CR9000XC has an on-board 10baseT/100baseT port, an Ethernet interface such as the NL100 is not required. Storage capacity can be increased by using a PC or CompactFlash card. The CR9000XC's PCMCIA card slot supports one Type I, Type II, or Type III PC Card or the CF1 adapter and one CompactFlash (CF) card. Other communication peripherals are compatible but they do not support the CR9000XC datalogger's maximum measurement rate and are therefore impractical for most CR9000XC applications. CRBasic, the CR9000XC's full programming language, supports simple or complex programming and many on-board data reduction processes. CRBasic is included in RTDAQ, LoggerNet, and PC400. 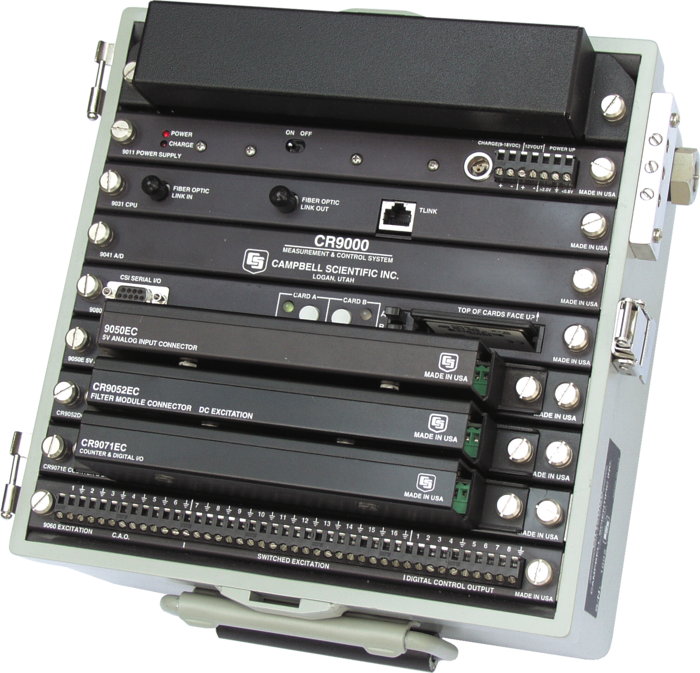 RTDAQ Real-Time Data Acquisition Software must be ordered separately; the CR9000XC is also compatible with other Campbell Scientific software. What might cause a CRBasic data logger to stop storing data? When will a data logger reset the switched 12 V channel (SW12)? The data logger will not reset the SW12 unless it is done under program control using the SW12() or PortSet() instructions, or unless the data logger compiles or recompiles a program. This could be done when a new program is sent to the data logger, or if the power is cycled.